The power of positive thinking is real, nowhere more than the golf course. Every prominent sports psychologist preaches pre-shot visualization. And every pro practices it. Develop a habit of seeing or “feeling” a great golf shot in your mind's eye and you'll chase the demons of negative thought that plague so many golfers. Visualization is especially useful on holes where water or other hazards can create anxiety and a self-fulfilling fear of doom. Be specific: Don't vaguely imagine your drive ending up in the fairway. Picture the shot exactly as you plan to execute it – starting down the left-center, gently fading right and bouncing past the 150-yard marker, for example. Drawing a sharp mental image will cue your body to make the necessary swing. Call on past experience: On a familiar course, think about the best shot you've hit on the hole you're playing. Duplicate it in your mind, then execute. This is a good way to keep bad memories at bay, too. Be realistic: If your typical drive is 225 yards, don't picture yourself launching one 300 yards. Delusions of grandeur are great when we dream, but can lead to overswinging on the course. If you are trying to improve your golf game only by focusing on the physical side of your skills, you are missing out on a big opportunity to get better. Golf is a game which demands physical excellence, to be sure – but it also demands a great deal from your mind as well. While on the course, you need to think clearly and make excellent decisions from start to finish. It is not always the golfer with the greatest physical skills who comes out on top at the end of the day. Sometimes, it is simply the golfer who uses his or her mind to the greatest effect. In this article, we are going to focus on the topic of visualization. Most professional golfers use visualization as part of their overall mental game, yet many amateur golfers skip this step and focus only on their swings instead. You may be surprised to find just how powerful visualization can be when you put it into action in your own game. While it will take a while to get comfortable with visualizing your shots – and it will take even longer to trust what you are picturing in your head – the rewards are worth the effort invested. Once you get comfortable with how visualization works, you will wonder how you ever played this game without it. It should be made clear right from the start that good visualization is not going to replace the need to make a quality golf swing. Naturally, you will still need to swing the club effectively from a physical standpoint if you hope to hit good shots and shoot low scores. Picturing a beautiful drive which soars down the middle of the fairway is great – but that vision isn't going to come to life if you don't have the mechanics to make it so. In the end, it is a combination of the physical and mental side of the equation that will allow you to reach your goals in golf. Pay each side of the game equal respect and you may be able to achieve levels of performance you previously thought to be out of reach. One of the great things about learning how to visualize properly in your golf game is the fact that this skill translates beautifully around the entire course. Rather than spending your time working on something which will only pay off in a specific situation, improving your visualization will pay off on every single shot you hit. Whether you are trying to hit a long drive from the tee, or you simply need to make a three-footer to save your par, you can use visualization just the same. The process doesn't really change from shot to shot, which means you will be adding some much-needed consistency to your game along the way. Later in the article, we will lay out step-by-step instructions for how you can use visualization properly. Before that, however, we would like to talk about the various ways in which this skill can benefit your golf game. There would be no point in learning visualization if it wasn't going to lead to lower scores, of course, so think of this section as the motivation which will encourage you to work on your visualizing abilities. Improved confidence. You already know that confidence is important in golf. What you may not know, however, is that visualizing your shots can go a long way toward improving the way you think about your game. If you struggle to believe in yourself while playing golf, try adding visualization as a way to boost your self-esteem. The process of visualizing your shots involves 'seeing' your shots travel perfectly toward the target before you actually help them. As long as you invest in the process fully, that vision of a great shot is sure to give you an improved expectation of your performance. Many golfers struggle with the hurdle of building confidence while they aren't playing great golf. To get out of that cycle and start believing in yourself, visualization may be the key. Smarter game planning. Course management is an often-overlooked part of this game. Strategy is a well-accepted element of other sport such as football and baseball, but golfers seem to dismiss the idea that a clear game plan can make them a better player. The average player thinks that golf is all about the swings you make – hit good shots, get good results. It isn't that simple, however. By thinking clearly and coming up with a good plan, you can achieve better results even when you swing is a little off track. By visualizing your shots, you can spot potential trouble spots which need to be avoided. For instance, if you visualize your shot and notice that you are landing the ball dangerously near a deep bunker, you could revise your plan to include more margin for error. Without visualization, you may have missed this threat and you could have wasted a shot or more as a result. Staying a nice rhythm. Another challenge you face on the golf course is maintaining a good rhythm for all 18 holes. IT can be tough to keep your swing in a nice tempo as you proceed through the round, since the average round of golf takes in excess of four hours. Over that time, you are sure to have your ups and downs, and those changes in emotion and temperament can have an effect on your swing. When you implement a visualization routine in your game, you will make it a bit easier to stick with your rhythm. This will be a consistent part of your pre-shot routine, and it will give you a couple moments to gather yourself and prepare to swing. If you are willing to stick with your visualization routine shot after shot, the results can be impressive. Deal with your nerves. Do you ever get nervous on the golf course? Of course you do – everyone does. It is a myth that only players who are contending for big trophies and large paydays will get nervous on the course. Nerves are a part of golf, and they are some of what makes it so interesting to play. You can encounter nerves simply by trying to break your own personal best score, or you can get nervous when hitting a tee shot in front of others. Whatever the case, conquering your nerves may be as easy as adding a visualization routine. Your visualization will give you a chance to step away from the situation and focus your mind on a single goal. When you are done, your mind should feel clear and you will be ready to perform. Hopefully, by this point, you are a believer in the power of visualization. Is this process going to fix every single problem in your game? No – of course not. It will help you play better however, and its effect will get stronger and stronger as time goes by. If you have not previously used visualization on the golf course, this idea might seem a little strange. Many golfers go around the course by simply getting a yardage, picking a club, and swinging away. Adding in a new step can be difficult, and you might have trouble thinking of this process as being an important part of your game. It is important, however, and investing in it will be valuable in the long run. To help you incorporate visualization into your golf game, we are going to lay out a step-by-step process below. If you can simply follow along with this process, you should be able to start visualizing your shots in short order. Find a time prior to hitting each shot where you can add visualization to your process. If you already have a pre-shot routine in place – and you should – you can simply insert this step somewhere along the way. It is best if you can do your visualization as one of the last steps before walking up and hitting the shot. Think about the process you go through before making your swings and decide where you are going to add visualization. You should be standing behind the ball when visualizing your shots. This will give you the perspective you need to picture the ball leaving the ground, flying through the air, and coming down on your target. Or, when putting, it will give you the right perspective to 'see' the ball rolling along the ground, taking the break, and dropping into the cup. By standing behind the ball, you will be giving yourself a perfect walk up into the address position when your visualization work is completed. When the time comes to visualize your shot, it is important to take the process all the way from start to finish. You should 'see' the swing you are making, the ball leaving the club, the path to the target, and the end result. Detail is important. The more detailed you can make your visualization, the more powerful the effect will be on your mind. Doing this halfway simply isn't going to work. You need to be fully committed, or you might as well not do it at all. It is important to transition quickly from the visualization phase into the actual act of hitting the shot. You don't want to rush, but you don't want to waste time, either. Step up to the ball, settle into your stance, and make a swing. If you allow too much time to pass after the visualization stage, the 'picture' in your mind will fade and you will lose the effect. Be ready to go and make a smooth transition from one step to the next. It will take some time to get comfortable with this process as a whole, but you should get there with some consistent practice. We can't tell you exactly how visualization should be implemented in your game, because every golfer is unique. Some players will have success one way, while others will want to do it differently. Now that you have a basic understanding of how this works, the best thing you can do is get out and experiment for yourself. Try different pre-shot routines with different visualization techniques until you settle into a groove that feels comfortable and productive. Remember, there is no one right way to play this game – as long as you stay within the parameters of the rules, there are plenty of different ways to post a low score at the end of a round. While it is true that everyone is different in how they play this game, and even how they visualize, there are a few tips we can offer which should help put you on the right track. 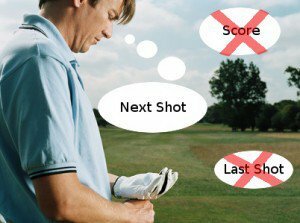 If you are having trouble effectively visualizing your shots, try some of these tips while practicing on the range. Try eyes closed and eyes open. 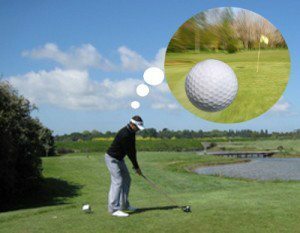 Some golfers like to keep their eyes open while visualizing their shots, while others find it distracting. To figure out which way works best for you, simply give them both a try. It should only take a few repetitions to determine which option makes you more comfortable. There is obviously more possibility for distraction when you keep your eyes open, so shutting them during visualization may make the most sense if you are prone to letting your mind wander. However, keeping them open will allow you to see the course in front of you, perhaps improving the accuracy of your visualization. Neither of these options is right or wrong, so trial and error is the only way to go. Details, details, details. We touched on this earlier, but it cannot be emphasized enough – successful visualization is all about the details. If you let your mind get down to the small details of the shot, you will be far more likely to 'see' the shot you are trying to hit. How is the club going to attack the ball at impact? Are you going to be taking a divot, or just picking the ball off the top of the grass? Is the shot going to fly all the way to the target and stop quickly, or will there be some bounce and roll? No detail is too small as you are trying to picture the shot you would like to produce. As you gain experience with visualization, it will get easier and easier to picture your shots down to the smallest details. Keep to yourself. You aren't going to be able to visualize your shots properly if you are still talking to others in your group while trying to prepare. Chatting with your playing partners is part of the fun in this game, but that chatting has a time and a place. When you are getting ready to hit, the conversation should stop and you should focus on making an accurate swing. There will be plenty of time over the duration of a four-hour round to talk about whatever may be on your mind. Always see success. This should go without saying, but you need to do your best to keep negative results out of your visualization process. If you are facing a particularly difficult shot, you might be tempted to allow your mind to stray in a negative direction. Don't fall into that trap. Seeing bad shots before you hit them can often become a self-fulfilling prophecy. Keep your mind focused only on the positive outcomes that you expect to achieve. Even if you are nervous about the shot, and even if your confidence is rather low at the moment, force yourself to be positive and expect success. As is always the case in golf, visualization is going to get easier as you gain experience. Just as you are now more comfortable hitting your driver than you were when you first started in golf, you will be more comfortable with visualization after some time has passed. Stick with it, commit yourself to the process, and trust that it will bring you improved results moving forward. Visualization is a powerful skill to possess as a golfer, but it is far from the only mental skill needed to play this game properly. Golf is a mental challenge above all else, and those who play well have learned how to use their mind as an ally rather than an enemy. Developing a strong mental game takes time, but doing so can take you to a level of performance that you previously thought was impossible. Below we have listed a few of the other key mental skills that you should work on developing along with visualization. Patience. There might not be anything on the mental side of the golf ledger which is as important as patience. When you stay patient on the golf course, you allow yourself to play up to your potential. Of course, remaining patient in this game is hard. Golf takes a long time to play, and there are sure to be ups and downs throughout the course of any round. When you make a big mistake and cost yourself a couple of strokes, how do you respond? Do you get mad and try to do too much on the subsequent holes to make up for your mistake? Or do you just give up, assuming that all hope is lost for the round? Neither of these responses would be a good one. Ideally, you will be able to keep your patience when things go wrong, understanding that it is just part of the game. The only thing you can do to teach yourself to be patient on the course is just to pay attention to this point as you play. When you feel your patience slipping away, try to take a couple deep breaths to slow yourself down and regain control of your thinking. No one is perfect with regard to staying patient, but do your best and your game will benefit. Course management. The decisions you make on the course with regard to targets and club selection will have a profound impact on your final score. Generally speaking, most amateur golfers play a brand of golf which is far too aggressive – especially given their skill set. Golf is a game which typically favors the conservative, patient approach. When in doubt on the course, play it safe and keep your ball in play. You always want to avoid penalty shots whenever possible, even if that means keeping your ball a little farther from the hole than you would have liked. Manage your way around the course with conservative targets and lower scores should be the end result. Holding up under pressure. You can feel pressure on the golf course at a variety of different times – even if you are playing alone on an empty course. For instance, imagine you are playing alone and you have a chance to set your new personal best score with just three holes to play. Even though there is no one in sight, you are still sure to be nervous. The mental strength to perform well even while nervous is something that all golfers must develop. Visualization, along with the rest of the mental game, is crucial if you wish to make progress on the links. One of the things that so many people love about golf is the fact that you can keep developing your game year after year, for a lifetime. That is fun, but it takes work as well. As you focus on visualization, be patient with yourself and watch for signs along the way that you are making progress. Good luck!